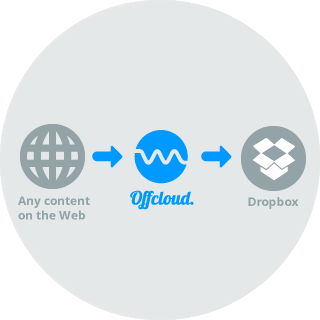 Offcloud lets you send data from the web to your Dropbox. If you are one of Dropbox’s 400 million users who upload roughly 1.2 billion files to Dropbox every day, rest assured that you can easily continue your Dropbox adventures with Offcloud. Offcloud’s integration with Dropbox gives you a simple and intuitive way to move your files from anywhere on the web directly to your Dropbox. If you are often on the move and have no choice but to download big amounts of data with limited Wi-Fi connections, Offcloud is the ideal tool for you. With Offcloud, you can copy the data directly to your Dropbox and download it later, when you have a better connection. The smart combination of Offcloud and Dropbox also comes in handy, if you are a team player who regularly shares a lot of data. By connecting the Offcloud service to your Dropbox account, you will benefit from Dropbox’s native sync feature. Just send your data to Dropbox, and it will instantly be available on all your devices. It works with all types of formats, including HTTP/HTTPS/FTP & BitTorrent file or magnet links. Offcloud functions as a tunnel and middleman between your Dropbox and the data you wish to fetch. It handles all the technical details and lets you concentrate on things that matter. Connecting your Dropbox account to Offcloud has never been easier. Simply go to your settings page and click on Add New Account under Remote Accounts. From there, you just need to fill your Dropbox email and all will be set. After connecting your Dropbox account with Offcloud, you can submit any links pointing to online content to Offcloud and we’ll do the rest. We will use our dedicated servers and broad bandwidth connections to download the content directly to your Dropbox. Uploading content to your Dropbox with Offcloud is free. With a free account, you can submit up to 3 links. Then, for just $9.99 per month, you can enjoy the service in an unlimited fashion.